Edition II From April 24 to October 28, 2015, in the beautiful setting of Piazzola sul Brenta, walking under the arcades of Piazza Paolo Camerini, in the front garden of Villa Contarini and in the most picturesque glimpses of the town, you can enjoy the rich contemporary art exhibition entitled "Sculture in acqua, in piazza, in aria" - now in its second edition. The curator of the exhibition is Giuseppe Pin, a sculptor from Piazzola sul Brenta, in collaboration with the city and with the promotion of the local Pro Loco. He brought together works by artists of the Academies of Fine Arts of Venice, Urbino, Verona and Milan. THE CONTEMPORARY ART EXHIBITION IS FREE. You can visit the exhibition every day and at all hours, except for the works on display in the garden of Villa Contarini, which are only accessible during the opening hours of the Villa. Please note that the Villa closes on Wednesday. You can reach Piazzola by car, bus and bicycle, through to the Ostiglia's bike path. For lunch or dinner, you can find various restaurants, pizzerias, bars and pubs, which are ready to meet your needs. Those who wish to stay overnight to enjoy the beauty and the various initiatives of the city can choose among different cottages and B&BS. Last but not least: don’t miss Italy’s largest market of antiques, which is held in Piazzola on the last Sunday of every month, a visit to the beautiful Villa Contarini, or the many musical shows and concerts especially in June and July. 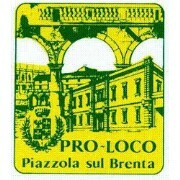 The Pro Loco of Piazzola sul Brenta is a local association founded with the purpose of promote and develop the local territory.